Subaru BRZ – Is this the car Porsche should be building? I have just driven one of the very first Subaru BRZ’s in the country, but why should I be writing about it in a Porsche Club magazine? Allow me to explain. 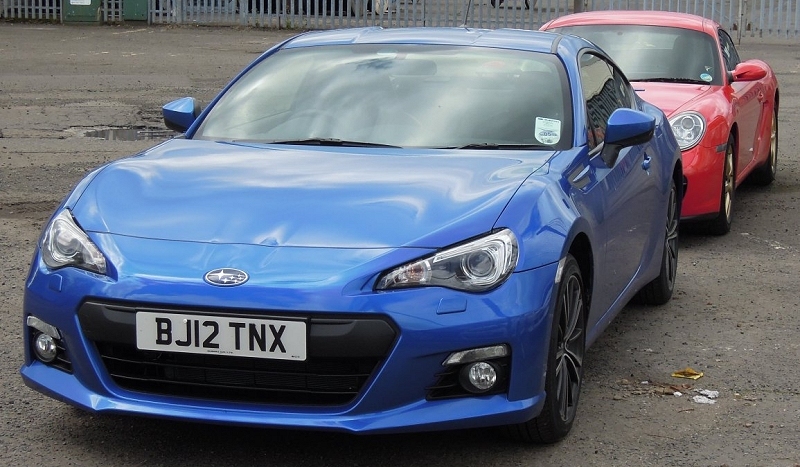 I am taking for granted that if you are reading this, you are petrolhead enough to already know what the BRZ is … a small light flat-four engined back to basics sports car developed with Toyota, which has had the motoring press in a ferment ever since it was announced. The real irony is that I am driving it just days after the announcement by Porsche CEO Mathias Muller that they have canned their own much reported project to build a small flat four engined sub-Boxster sports car. So my question is … have Toyobaru made the right decision, and more importantly have Porsche got it wrong? Let’s drive. I pull up in my Cayman and park behind the BRZ, and as is immediately obvious from the pictures, they are remarkably similar in size and shape, even if not in mechanical layout. Getting in it was like a sense of deja vu ... everything about it was just like the Cayman ... the low set seat, the position of the pedals, wheel, gearlever, even the belt line and the glazing proportions were identical. 3 round instruments, identical in layout to the Porsche, right down to the digital speed readout. Drive off and it jiggles over broken tarmac just like the Cayman, but it flowed well when you picked the speed up. 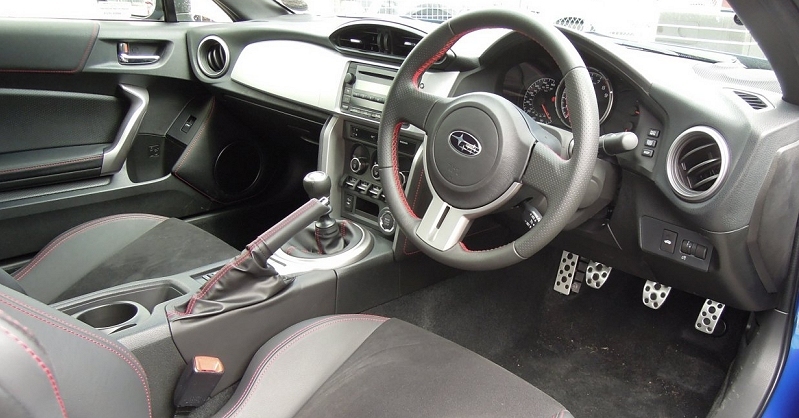 Lovely steering, excellent turn in, no body roll, low centre of gravity, great control weights, supportive seats with leather edges and Alcantara centres. Not a torque monster, but perfectly OK and more than fast enough, and get it into the rev band through some twisty bits and it really comes alive in your hands. A proper drivers car. I drove it for about 10 miles, but in truth it took about 400 yards to feel like I had been driving it all my life. The similarity to my Cayman is surely no accident. I’d wager that the Toyobaru chaps have looked long and hard at the current small Porsches as their benchmark while designing this car, and it shows. There is something almost indefinable about a Porsche that no other cars seem to have, perhaps until now anyway. Mercs always feel soft and rubbery to me, Audis are stiff and uncommunicative, and BMW’s just never seem to fit me somehow … good cars though they all are. Every time I drive a Porsche, it feels more like I put it on and zip it up rather than sit in it, and this goes for everything from my Cayman to the Panamera. Of the cars from my past, perhaps the early Honda CRX’s came closest to that Porsche feeling, which maybe explains why I had 4 of them. If I was to sum up the BRZ I’d say it felt like a grown-up CRX, but with a lot of modern Porsche feel to it, and that is mighty high praise indeed. Downsides? Well the Subaru definitely feels a bit more low rent inside than my Cayman, nor is it as pretty a car. Hit a bump mid corner and it lacks the chassis sophistication, and perhaps its worse feature is a rather tuneless blare of induction noise from its flat four, rather than the creamy wail of the flat six. But struth … it’s £24,999! I drove a new Boxster S last week and it was awesome, as well it might be cos with extras it would have been well over twice the price. Was it really twice as good as this little Subaru … that’s a tough question. In a perfect motoring world where petrol was free, there were no camera vans, and the general populace did not drive everywhere at 46 mph, perhaps it would be. Sadly in the real world of UK roads, so much of what the modern Uber-Porsche offer is frankly unusable, that it makes me wonder which car is the more relevant to today’s needs. And frankly it makes me wonder about Herr Muller’s decision not to build a smaller simpler Porsche. His explanation was that it would dilute the brand. Err sorry, but does the whole Porsche history not spring from a light flat-four sports car? Porsche love to make much of this history, but it seems it can be ignored when it is convenient. The truth of course is that there is nothing like the profit margin in small simple cars like this than there is in Panameras and Cayennes, but I suggest Porsche is missing something here. Making money is important for sure, but on our congested and over-regulated roads, a simple efficient light sports car allows you to still have fun, rather than frustration. If you should read this Herr Muller, can I suggest you borrow one of these delightful little Subarus and perhaps think again. Ó John R Hunter With thanks to Ian Grieve Subaru, Falkirk, for the loan of the test car.